It is currently visa free for British people to travel to Kyrgyzstan. You can enter and stay for up to 60 days. If you stay in Kyrgyzstan for over 60 days without a valid visa, you’ll be liable for a fine. It’s not possible to get a visa in Kyrgyzstan if you originally entered the country without a visa. If you think you may spend more than 60 days in Kyrgyzstan. If you are entering by car however this rule is slightly different as the car can only be imported for 30 days. This can be extended once in at a customs office (if you can find one). This procedure however is apparently expensive and requires several forms, rubber stamps and possibly a few back-handers. We reached the Kazakh border (Taraz to Talas) at 8.15am - it was very quiet with no queues. At the first barrier a military guard checks your passports and photographs the car registration plate. You then continue to a border inspection kiosk where they instructed us to park at the customs area. We were directed into a passport control building where they put the Kazakhstan exit stamp on our visa. Once we showed this stamp to customs they did a brief search of the car for only a few minutes then I had to exit on foot while Andy drove the car through the Kazakhstan exit barrier. No problems, didn’t need to pay anything. On arrival to the Kyrgyzstan entry border the car registration was again photographed. At passport control we received a 30 day entrance stamp (no visa required for stays of 30 days or less). The car was searched twice, the first was a military check which was quite thorough- a guard looked in every box, the fridge and roof-tent. We then drove to the customs search which was quite quick and very friendly (they were more interested in taking selfies with Andy and the car than searching it). There is a small customs office, the officers were very friendly and helpful and even found a car temporary vehicle importation declaration form in English. The officers filled out two, they kept one and gave one to us. 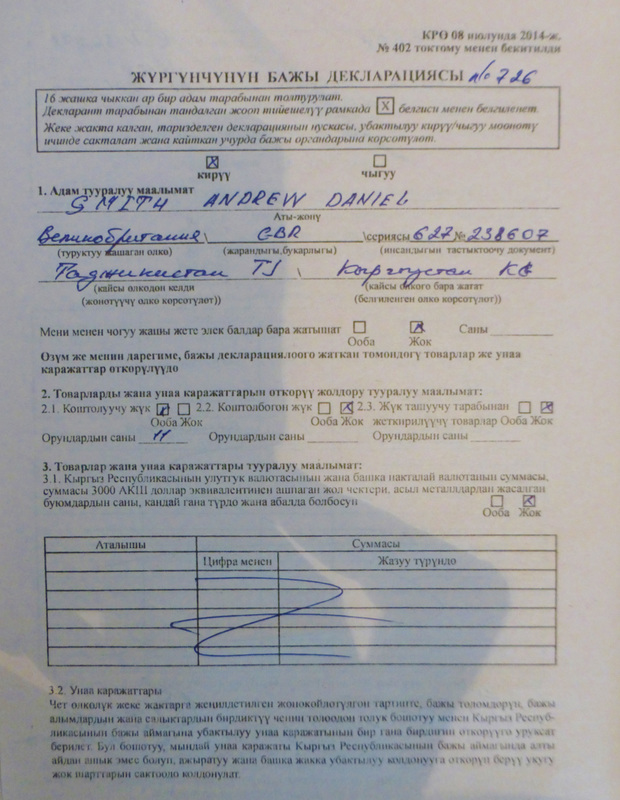 The car is imported for 30 days - keep the stamped paper to show on exiting Kyrgyzstan. We paid nothing to enter Kyrgyzstan. It took just over an hour to make the entire border crossing, relatively straightforward with no problems and no charges. We arrived at the border (Isfara to Batken (Kyzkl-Bel)) around 8.30am, very quiet, no queues. 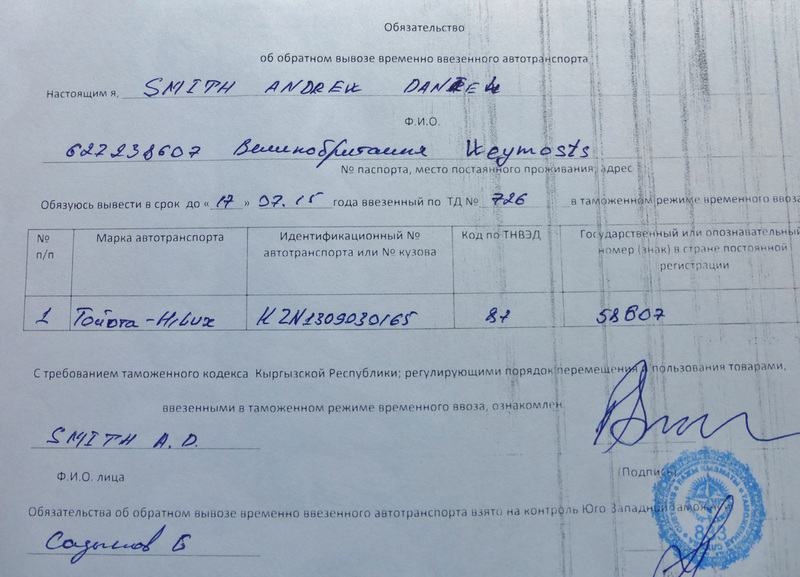 At the Tajik side our car customs importation document was stamped and collected. They didn’t bother checking the car. Passport control took a few minutes only to issue and exit stamp. All the guards were friendly and we were not asked for any money! I was also told by the tourist information office in Khorog that there should be nothing to pay when you exit Tajikistan. If they ask, say you have no money or you have been to the tourist office who told you that everything was paid for on entry- be polite and patient, many border guards in Tajikistan are after money. We had a report of other overlanders exiting Tajikistan from Karakul to Sary-Tash (Bor-Dobo) where they were again asked to pay for ‘disinfection’ of the vehicle and another $10- they stood their ground and left without paying this. He asked for 1,000 Kyrgyz Som for ‘Ecology Tax’ (an official requirement). We had no local currency so he converted it to $17 which I gave him exactly but he saw I had a $20 note and asked for that instead. I assumed he didn’t want one dollar bills. He gave us the receipt for the Eco Tax, the completed customs form and 2 cucumbers?!?. You will likely have to submit the Eco Tax receipt on your departure so keep hold of it. If you don't have it you may be fined or have to pay again. Strangely when we left we didn't have to submit it. I asked for my $3 change. He hesitated and said it was an “admin charge”. I said I wasn’t going to leave without it and there was no such thing as an admin charge, he rummaged in his pockets and gave me the equivalent of $2 in Kyrgyz Soms. I reported his ‘admin charge’ rubbish to another customs guard outside who searched the car, he looked very embarrassed and gave me the equivalent of $2 in Soms. First ever border crossing left in profit! The car was searched briefly; fridge, open rooftent, kitchen box. The border was very quiet and easy with the exception of the Kyrgyz customs officer trying to ‘keep the change’- was pleasantly surprised with how straightforward exiting Tajikistan was here as heard many stories of hassle when leaving. We crossed in about an hour in total. This information is about our experience applying for visas and crossing borders. Obviously please try and find the most recent information you can as visa application and border information changes daily. If you have any questions please feel free to email us.